Quite thick. Warm and comfy for cold winter nights. Really like it. Washed well. 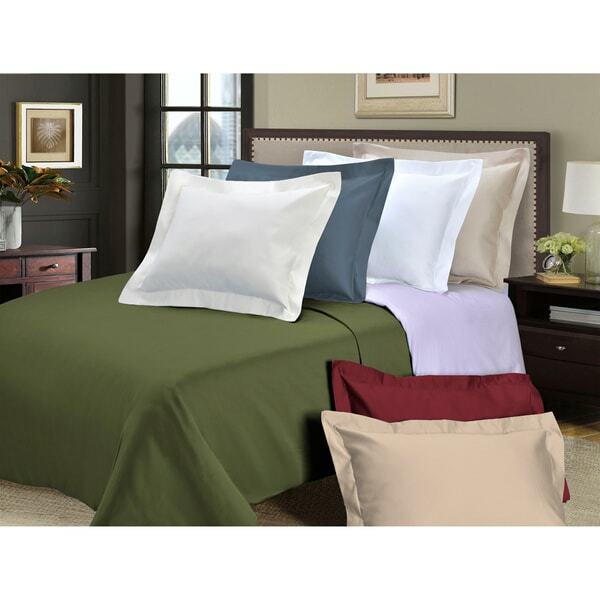 Experience the soft feel of this 100-percent cotton 800 thread count duvet cover set. Available in 8 solid colors, it is smooth to the touch and will complement any bedroom. This elegant set not only catches the eye, but is also conveniently machine washable. This item showed up with crusty stains all over the pillow cases and pulled up hair and fur on the duvet. It is clear these sheets were used, returned and then resold with no warning to the buyer. I wouldn't buy ANYBODY's used sheets! Let alone pay *** for them!!!! Do not buy this Product. I love this duvet cover set! The blue is GORGEOUS! It is both luxurious and well made. I plan on buying it again in another color! We have had this set for a while, and it has held up very well, even with our 3 cats. We bought it in the blue color. It looks a little darker in person than in the picture. Nice thick material, which is great in the winter, but can be hot in the summer if you don't switch the comforter to a lighter weight. Washed well, with only minimum wrinkles if you get it out of the dryer immediately and shake it out. Nice fabric and the color was as described - I ordered the brown. This is my "go to" duvet cover. I have purchased two so far and have been very happy. Purchased in white. Fabric is very thick and feels luxurious. Love it. Nice heavy duvet cover but still soft enough to sleep with. The duvet cover is nice quality, but very heavy. The thick fabric is not comfortable to sleep against. I thought washing would soften the fibers...otherwise I would have sent it back for a refund. Very nice duvet, very soft and substantial. Holds up well to everyday use in my daughters room. Have had for a year now, and it still looks great after washing and teenage use! Perfect! Even better than I expected! Super soft & comfy!! We Love it! "Does it have ties in the corners?" "Is the material made with Sateen?" The product has a Sateen Finish. It is the weave type and not a fabric blend. Because, in the past, I have purchased this same product and have been quite pleased. I liked the color and it was a solid color.